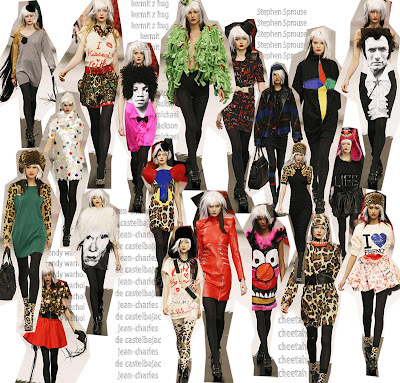 Jean-Charles de Castelbajac is one of my favorite designers. Always! His collection is once again, BOLD and charismatic. His fall 2009 runway inspires fellow designers around the globe to be daring, and try something more imaginative. After all as a designer, you set the pace for the rest of the world. Use your talents well. :) And you see that with Castelbajac, season after season he consistently nails this 'idea' to an extreme... which is why I ♥ his bravery... With this fall showcase, I get a sense that Jean-Charles is playing tribute to the late Stephen Sprouse with the graffiti-inspired print on the over-sized tee's (below). I adore the morphing of a pop-inspired tee collection of silk-screened faces. For Spring 2009, Castelbajac gave ♥ to President Barak Obama.